If you live in India and you are searching for a good baby carrier, please continue reading this post and find the best solution to your need. We have also listed the best baby carriers in India in the lower section of this article. Picking the Best Baby Carriers in India? Since you are a new parent, before picking the best baby carrier, you should keep in mind the concerns like the age of the child and who will be carrying the baby most of the times. The safety and comfort of the baby are of utmost importance. So picking the carrier should not be compromised on choosing cheap unbranded products. In the growing years, they can hamper the posture of the baby. The positioning of the newborn has to be correct. The hip is the most vulnerable part this time. The parents themselves are vulnerable to injuries too. Parents with back issues have to be very cautious before making their buying decision. The mothers with c-section deliveries are more prone to chronic backaches. The duration of its usage is very crucial. Don’t pick the ones that are cheap and would create discomfort during the long haul. We have detailed article on Baby carrier’s safety. Check it here ==> Are Baby Carriers Safe? Ergo has been recognized as one of the most reputable brands for baby carriers in India. Their products are colorful and are made of the child-friendly dyed cotton cloth. Babies will feel totally comfortable with this carrier as they are seated in an M position that helps prevent hip dislocation. Their products also provide comfort to parents. The products from this manufacturer are known for being lightweight and sturdy, giving the best value for the hard earned money of the customers. These products are pretty much easy to use compared to slings and wraps. This one is known for having that ergonomic design and it fits the parents perfectly & securely with just some easy adjustments. This product is best to use for growing babies and it can be used for kids of up to two years of age. It can carry a maximum weight of 15 kilograms. It was specially developed so as to provide proper and adequate support for the head of the baby, neck, hips, and spine. Your child will also feel warm while you use this. At a very affordable price, you get a quality baby carrier that is giving a multitude of benefits to parents and kids. This baby carrier is suitable whether your baby is a boy or a girl. It weighs 3.6 kilograms which means it is very lightweight and it can carry a maximum weight of 14.5 kilograms, making it suitable to be used with your baby up to his or her two years of age. The convertible carrier comes with an ergonomic seat designed for optimum positioning of the hips of your baby, preventing injuries to his or her delicate body. It also comes with a supportive belt around the waist and flexible padded straps so you won’t feel pain while spending hours in carrying your baby with this. If you are looking for a baby carrier that can carry your more than 2 years old baby then this product is the right choice for you. This baby carrier is mainly intended to accommodate babies of up to 3 years of age. Just like the other baby carriers on this list, this one also comes with an ergonomic design, providing comfort for your child while it comes with padded belts that are truly flexible and will never cause pain on you even when you put it on and use it for hours. Last but not the least is this baby carrier that comes with an elegant design. It offers optimum support for the child while giving utmost comfort for the parents. You will surely love its design that can be perfect for either a baby boy or a baby girl. These are the leading 5 baby carriers in the market today. Choose the item that best suits your needs and your budget and makes the most of it with your baby. Baby-wearing has become part and parcel of a mommy’s life. Using a baby carrier can turn out worse if you have a bad back. There is no secret that back pain doesn’t spare anyone. Of course, it cannot be a justification to escape carrying your baby. You can find different types of carries to suit your comfort. If you go by popular choice, the sling type, it is not good for moms with back pain. If you wish to carry your baby around, with a bad back, you are at the right place. Here is the list of the best baby carrier for a bad back. This baby carrier has many prominent features rarely found in similar counterparts. The fabric is the baby carrier gives ultimate protection. A special feature that makes you smile is hip seat spots. It allows you to carry the baby aged older than 3 months. Maximum weight you can carry is 12 kilos. The Carrier provides lower back support with soft cushion material. 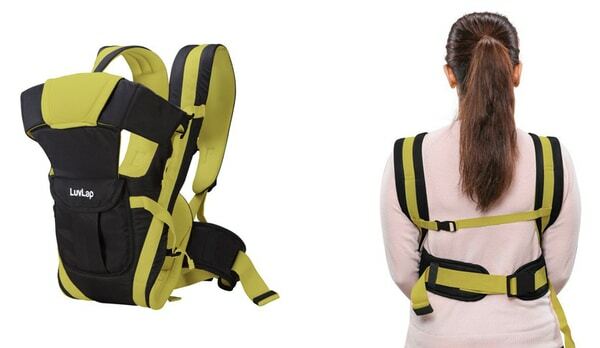 The weight evenly distributes on your shoulder, which prevents a backache. It has a soft cover for the baby head, breathable mesh, and has no harmful substances which can harm the baby skin. No more sore arms and aching back. The instructions that come with images are self-explanatory. The hip seats give phenomenal relief to your back, no pain, and no stiffness. Wear the baby carrier as easy as changing the diaper of a baby. The carrier is extremely versatile enough to carry your baby in more than 10 positions. Pockets to hold keys, mobile phones etc. Some of the users feel that hip seats are heavier and difficult to put on the hood. The Infantino Cuddle Up Ergonomic Hoodie Carrier help you carry your child with ease. Whether you choose to wear the little one on the front or the back, you can do it without hurting your back. The ergonomic design distributes the weight evenly. This carrier can be put to use for the babies that weigh minimum 12 pounds to maximum 40 pounds. However, you can also use it to carry your newborn with adjustable straps and waistband. This is the most preferred and reputed baby carrier available in the marketplace, meant for moms and caregivers with a bad back. You can let the baby sit facing you or facing forward enjoying the outdoor views. There is sufficient space for the babies to put the leg out comfortably. The hoodie covers the baby’s head. Multiple buckles help to adjust the length which makes a good for both mommy and baby. When it comes to drawbacks, some of the users find difficulties in the following aspects. Get all your baby-wearing needs with the Mo+m cotton baby carrier. You can wear the baby on your front, back, or hips. It helps you carry the baby safely and comfortably. This is one of the best baby carriers for the mommies/caregivers with a bad back. The carrier allows the baby’s leg in a safe position, which prevents discomfort in the hip/back. The weight of the baby is distributed evenly across your shoulders and torso. It prevents you getting hurt and back pain. The carrier has an in-built hoodie for the baby, which covers the baby head. Most of the mommies have been using baby carriers, both inside and outside the home. Mommies who are on their toes need a comfortable baby carrier. Make it easier by choosing the baby carrier that doesn’t hurt your back. Baby-wearing is an important decision for a new parent. Many types of research proved the fact, babies who are held more feel utmost comfort and cry less. Besides it also creates bonding and promotes physical growth in babies. Safety aspects, fabric, and the structure of the carrier are the few deciding factors. Besides, the price of the baby carrier is also an important decisive factor. There is no hard and fast rule that supreme carriers are expensive. If you look for cheap baby carriers under 1000, this is for you. Chinmay Baby Carrier is a versatile carrier that enables you to carry your little one comfortably. It allows you to carry the baby in 4 different positions. This is the biggest advantage of any baby carrier. It is not possible to hold your baby in a specific position. It may not be comfortable for the baby and/or the mom. You can wear the baby as you prefer at any particular moment and change as per the comfort. It also helps you identify the comfortable position for your baby too. Carry your baby in 4 different positions. • Newborns love the chest way wraps as they feel very cuddly. • Carry the baby in kangaroo style. • Cross arm carry works like a sling. It is the most comfortable for babies. This baby carrier also features other important elements of a comfortable baby carrier. The high-quality durable fabric is suitable for a long wear. The shoulder belt and waist belt comes are adjustable. The carrier has double protection safety buckle and ventilating back pad, which doesn’t cause pain. It is easy to wear, operate, adjust, and carry the baby flexibly. And it is suitable for just borns to babies aged 30 months.When it comes to a few drawbacks, some of the users find the inner fabric a little rough. It might harm the extremely sensitive skin of the babies. A few also find that stitching quality is poor. When you look for a certified product, here it is. Little Pumpkin baby carrier is a certified product ensuring utmost safety. The design of the baby carrier features the proper support. It supports the baby and the mommy. You get ultimate protection when carrying your baby. It supports the baby’s wavering head and neck, and hips and spine. This carrier helps you wear your baby in three ways. Carry the baby facing the front, facing your chest, and wearing the baby on your back. The major drawback, it is not suitable for the baby aged less than 6 months. So, if the baby neck is not stabilized, it is not comfortable. 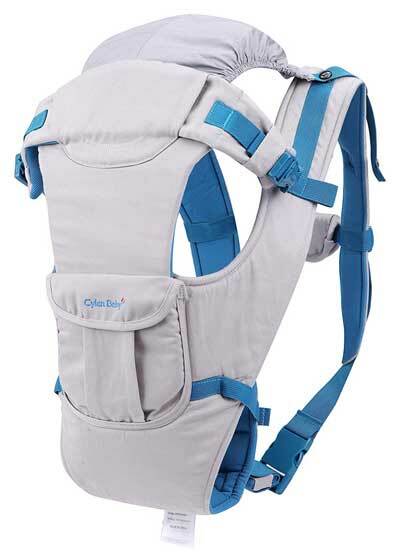 Age suitable for the baby carrier is 6 to 24 months. In many cases, it doesn’t suit to carry 24 months baby. These are the top three best and cheap baby carriers under 1000, with maximum supporting features.